Since many in attendance were from rural areas, the discussion centered around the shortage of doctors in our state and the lack of available medical seats for aspiring doctors from our state. Brown noted that of the 25 most populous sates, Washington ranks last in medical school enrollment per 100,000 people, according to the Association of American Medical Colleges (AAMC). There is also a severe shortage of doctors in rural areas throughout Washington. WSU’s proposal for a medical school in Spokane is to use a community-based approach, which would, among many things, actively seek to recruit those in rural and underserved areas for admissions. The AAMC says that less than one percent of medical students are from tribal communities (tribal communities are often in rural and underserved areas). WSU would target those students and also plans on creating a pipeline and bridge programs for underserved K-12 students. Brown also shared a couple of other features of the community-based medical school model: no new teaching hospital (rather, students would be sent to teaching clinics in locations throughout the state) and partnerships with existing community hospitals. WSU’s Spokane campus is the university’s designated health sciences campus and already has $208 million worth of infrastructure in place. The university already has existing relationships with the area medical community, as seen in the formation of the Spokane Teaching Health Center consortium, which is made up of WSU Spokane, Providence Health Care and Empire Health Foundation. The three partners helped with the creation of the University District Health Clinic, which will be run by Providence on the WSU Spokane campus and will allow medical residents the chance to work with patients. Speaking of medical residents, that’s the other side of the coin in the medical education discussion. 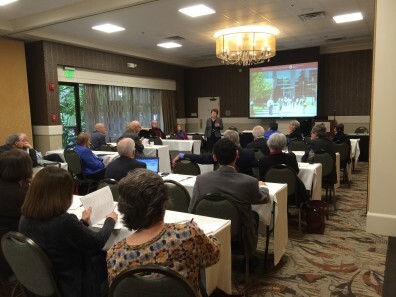 At the Rural Health Conference, Brown noted that there are just 46 first-year residency slots on the east side of the Cascades, compared to 348 in the Seattle Metro Area. In total, there are 409 first-year residency slots in the state. Residencies are federally funded, and thanks to a $900,000 grant from the Health Resources Services Administration (HRSA), six new residents started in Spokane last summer. However, the HRSA funding expires at the end of this year, and it is a priority for WSU to extend the program so we can grow the number of medical residents in our region. Where students study and where they complete their residencies goes a long way in determining where they will eventually practice. A lot of decisions are still to be made in Olympia. The House and Senate each passed identical bills that would allow WSU to operate a medical school. The final bill still needs full passage and a signature from Governor Jay Inslee. There are also budget discussions to be had, and the House is expected to release its first budget proposal by the end of March. We will keep a close eye on things in Olympia as we pursue a full College of Medicine at WSU Spokane. For the attendees of the Rural Health Conference, it was good to have the information on WSU’s plans for a second public medical school. Someday (hopefully soon), these rural health providers may be working with WSU medical students in their cities and towns.